In some cases you may want to fit the data with two peaks with the same amplitude for example. You can do this in two ways: by specifying custom Fit Curve with your equation or by joining the 'amplitude' parameters of two peaks. To join parameters of two or more Fit Curves select one of desired Fit Curves, then select desired parameter in parameters table and press Join button in the bottom of the panel (or double click on parameter). You can specify the selected parameters as equal or proportional by entering multiplier and constant for each parameter. 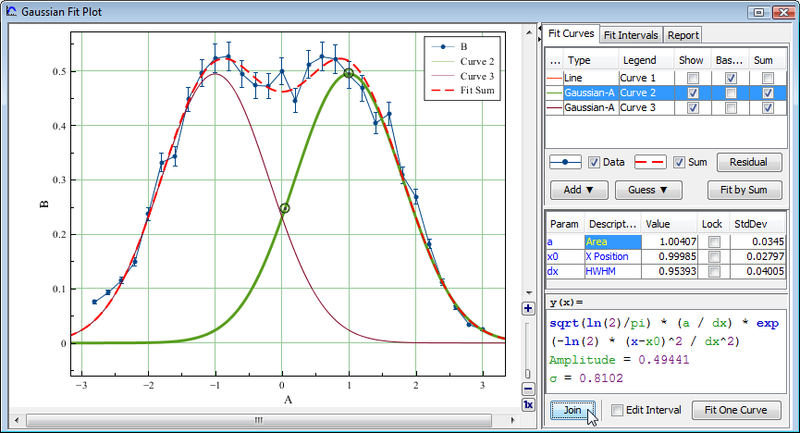 Joined parameters are shown with blue color (instead of black) in curve parameters table in Fit Plot window. Joined parameters are treated as one parameter when fitting, so joining results in the reducing of actual model parameters number. In the example above the areas and widths of tho peaks are joined and are equal. The positions of maximums are joined and inverse: -1 multiplier is set to the width of Curve 3.